Special intervention brigade forces from Tanzania, part of the UN peacekeeping mission in the Democratic Republic of the Congo - MONUSCO, on duty in Sake, North Kivu (July 2013). The United Nations peacekeeping mission in the Democratic Republic of the Congo (DRC) announced today that it will, for the first time, use its intervention brigade to enforce a security zone around the flashpoint city of Goma in the eastern part of the country, giving rebels 48 hours to disarm. A statement issued by the mission says that any individuals in the area of North Kivu province that includes Goma and Sake who are not members of national security forces will be given 48 hours from 4pm (Goma time) today to hand in their weapons to a MONUSCO base and join the DDR/RR (disarmament, demobilization, repatriation, Reintegration and Resettlement) process. “After 4pm on Thursday, 1 August, they will be considered an imminent threat of physical violence to civilians and MONUSCO will take all necessary measures to disarm them, including by the use of force in accordance with its mandate and rules of engagement,” the statement says. Over one million civilians live in the relatively small area of Goma and Sake, and along the road that connects them where, amongst others the Mugunga camps, temporary home to nearly 70,000 people displaced by the conflict, are situated. According to MONUSCO, since mid-May, the area has seen repeated attacks by M23 against national troop (FARDC) positions in an apparent attempt to advance on Goma and Sake. “In these attacks, the latest of which started on 14 July, the M23 has used indiscriminate and indirect fire, including by heavy weapons, resulting in civilian casualties, the Mission says, adding that M23 has also targeted UN installations. “The security zone will push these indirect fire threats out of range of Goma [and] may be expanded and repeated elsewhere, where it is needed,” the statement says. The deadline follows the arrival in Goma of MONUSCO Force Commander, Lt. Gen. Carlos Alberto dos Santos Cruz, who announced that the Mission will support the Congolese Armed Forces (FARDC) to establish a security zone around the area of Goma and its northern suburbs. Over the past year, the M23, along with other armed groups, has clashed repeatedly with the FARDC in the eastern DRC, with the rebels briefly occupying Goma in November 2012. The fighting, which erupted again in recent days, this time dragging in a group of Ugandan-based rebels, has displaced more than 100,000 people, exacerbating an ongoing humanitarian crisis in the region which includes 2.6 million internally displaced people (IDPs) and 6.4 million in need of food and emergency aid. Adopted in February by 11 African leaders and four regional and international institutions (11+4), the document and has since been hailed as a “framework for hope” in the Great Lakes region. 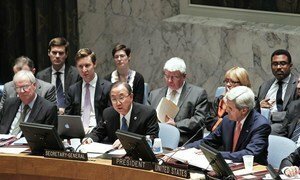 The Security Council today restated its commitment to the United Nations-brokered peace accord for Africa’s strife-torn Great Lakes region and demanded an immediate end to hostilities in the Democratic Republic of the Congo (DRC), where fresh clashes between armed rebels and Congolese troops have sent thousands of civilians fleeing for safety.